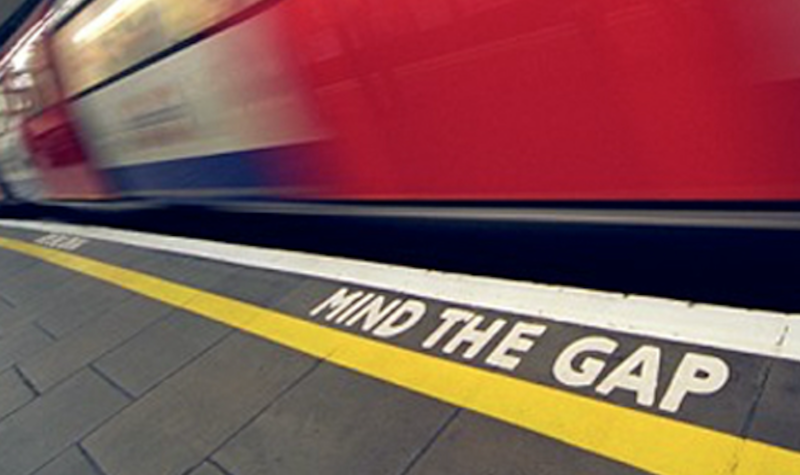 The phrase “mind the gap” is a warning issued to rail passengers reminding them to take caution while crossing the space between the train door and the station platform. It’s a more kind and caring way of saying, “don’t fall in this hole and break your ankle.” As I’ve considered the mindfulness it takes to keep my ankles safe, I’ve started to wonder what other gaps may need my attention. These gaps might also exist in our understanding around issues of justice in our society. What holes do we fall into that keep us from connecting our faith more fully to the world around us? In a TED Talk last year, Arthur Brooks asserted that one of the holes we fall into is thinking that it’s enough to simply tolerate each other. He says that tolerance is a way justifying having low standards for not being able to understand someone with a different perspective. The National Academy of Sciences recently published a study on what is known as ‘political motive asymmetry.’ This study found that there is a constant gap between us and others because we assume that we are motivated by love, while our opponents or ‘the other’ are motivated by hate. This seems like such a dangerous gap - one that inevitably leads to divisiveness and brokenness. Brooks argues that it’s not enough just to tolerate each other; we need to need each other. Paul writes in Galatians 6:2 to “bear one another’s burdens and in this way you will fulfill the law of Christ.” The Message translation says it a little more bluntly: “Stoop down and reach out to those who are oppressed. Share their burdens, and so complete Christ’s law. If you think you are too good for that, you are badly deceived.” The notion of bearing someone’s burden means to hold their needs, struggles and concerns with the same regard and intentionality that we hold our own. Finding commonality in our shared needs makes the gap between us a little less wide. This is a foundational piece of our faith in Christ: that we are called and challenged not to simply tolerate each other, but to need and even love each other. This does not, and will not, minimize our differences, but it can help us to become more aware of the predictable pitfalls that keep us from one another. If we are actively working to ‘mind the gap’ in our reactions, assumptions and understandings of each other, we might find that this gap could be not only minded, but bridged - a bridge, with God’s help, over which we are able to ‘seek justice, love kindness, and walk humbly with God’ (Micah 6:8). This Sunday, we are starting a new sermon series called Building Bridges. Over the coming weeks, we will be asking these questions: What does it mean to be a Christian when it comes to issues of justice in our society? Does God care about politics? How can two people on opposite sides of an issue both claim God's support? Our prayer in this series is that we find ways to build bridges over gaps in our knowledge and experience and connect our faith more fully to the world around us. Hi Julie, challenging topic! Sometimes I find it very difficult to understand when to jump in and help and and when not. Maybe it's only because I'm trying to play by my wishes and not Gods. Looking forward to Sunday thanks !